So I was all set to record podcast on Sunday, things were typed up, put in google docs, microphone out, computer restarted, ready to go, and stuff just came up about 3 hours earlier than I expected, and then there was an issue to take care of “right now” which involved parts in the rest room, water, traveling to town and back, vice grips, and large plastic screws. And the rest of the week is usually so hard to sit down and focus after work on recording, and I have somehow decided to pack an entire half year’s of activities into the single month of March. For one, my dad & brother, of whom, I haven’t seen in two years, just decided to tell me last week that they’re coming next week, in the middle of the week. Which makes me elated, but also makes me crazy. No real amount of time to prepare, and this is running in the back of my mind, in the front of my mind, oh crap the house. And no I couldn’t request for it off work due to time and other people had it off already. Happy yes, stressed yes, it’s hard to tell my dad ‘uh no this isn’t a great time’ because that’s kinda how he is. I have/had other weird things like a wedding reception to attend Saturday, and presents to buy, and invitation I can’t locate anywhere, and guild treats to bring (heart set on making caramel/peanut butter popcorn), ran out of ingredients twice, oil change, mountains of laundry, birthday coming up, fabric everywhere. A breakdown ensued the Sunday before last, just knowing all the more things packed into this month than the March A Long, and the March-A-Long podcast that I had lovingly planned. Also a bunch of snippy remarks after things blew up sunday so spectacularly at the end of the day. 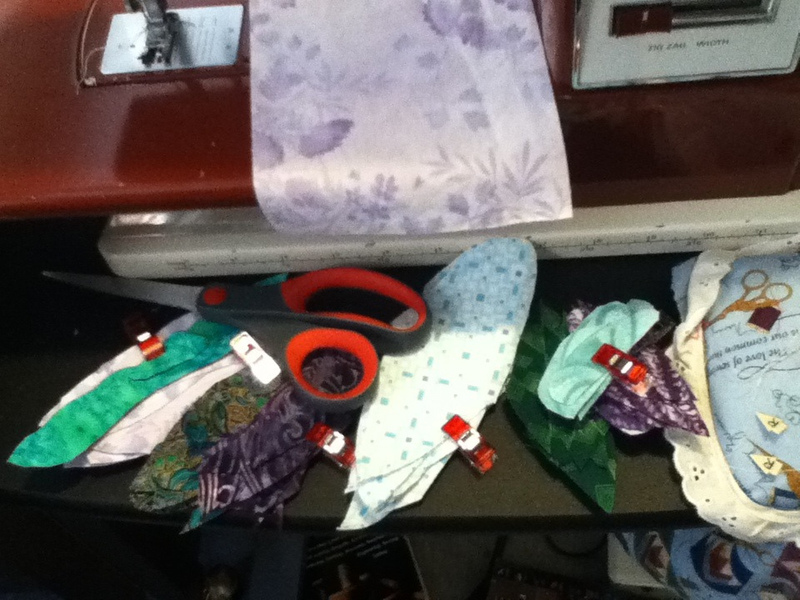 So, things didn’t work out for podcast this past Sunday, but I HAVE been trying to be creative in getting my 15 minutes of quilting done per day, even if sometimes I’m switching projects from one to the next. Picking and choosing projects & parts that are good to make in 15 minute increments. And Saturday/Sunday before the bottom of my day fell apart, I was working on these beauties, which are strips to a hot air balloon that I’m working on flushing out. Yes, a UFO that’s just gotten started. Sorta. It’s that time again to sign up for the bloggers fall quilt festival. 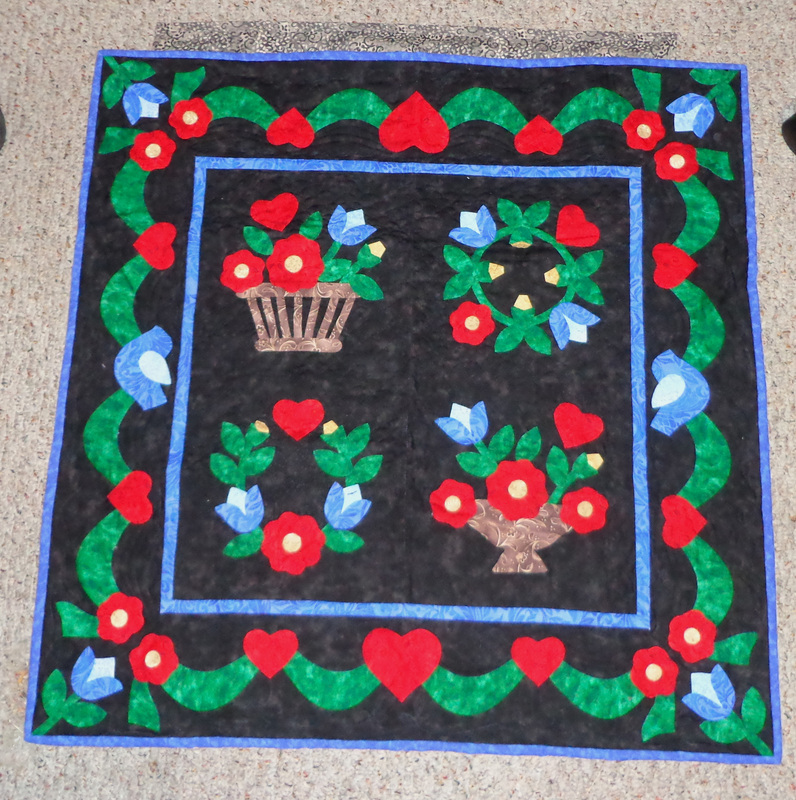 The quilt I am entering is a recent finish, but not a recent start. 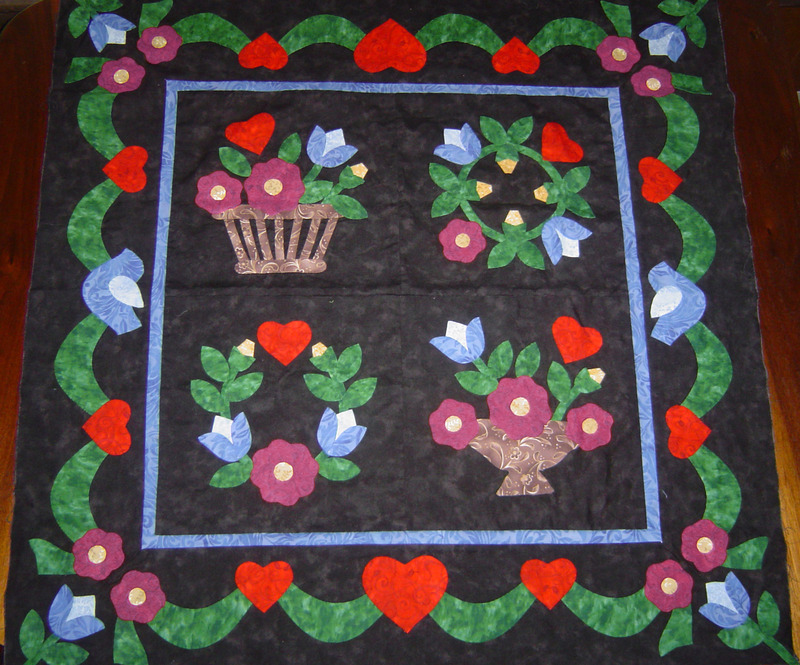 This was my first ever applique quilt learned from an applique class. The pattern is in Mimi Didrich’s Favorite Applique book, and I didn’t have much of a stash at the time. I added the birds on the sides from the pattern she has later in her book. It was never my intention to “make a balitmore album quilt”, but this was the pattern I needed for the class I took, so here it is. So so glad I put the background as black instead of white. I think my colors pop, but I do sort of wish I had a little variation in the flowers or even the swag. But I still love this little quilt. Here’s a photoshopped version of this quilt (not true colors). 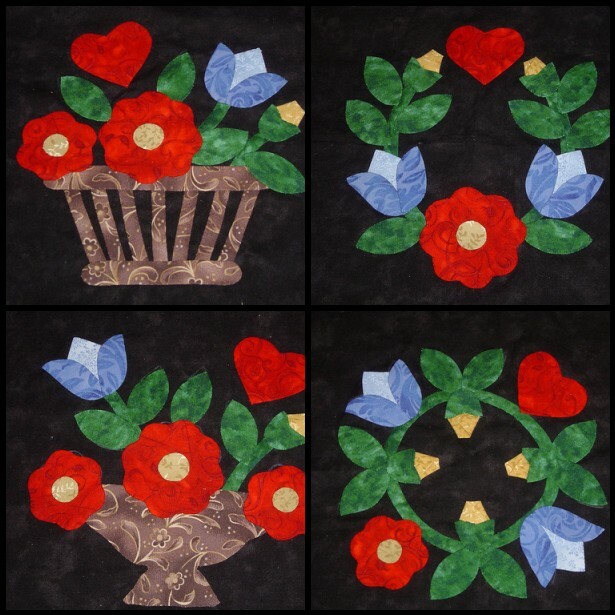 Our class was to applique every week a different block or two or 3. 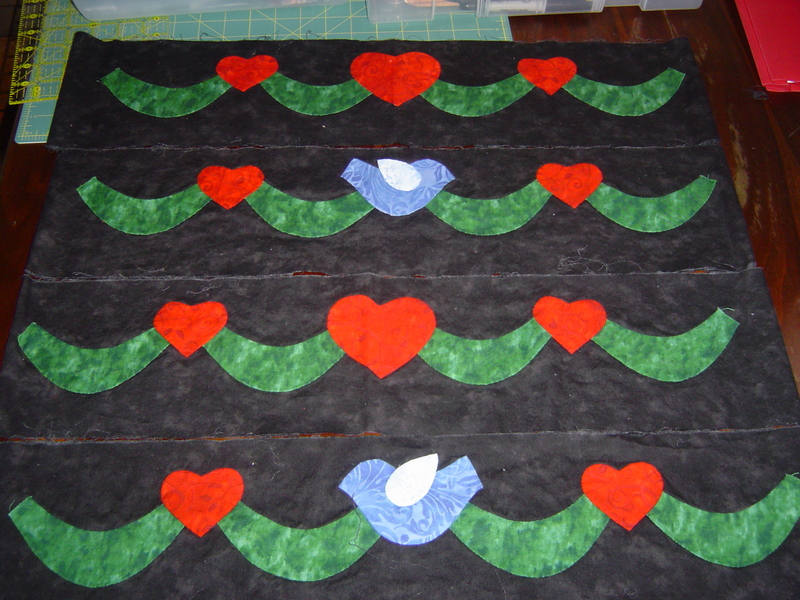 I don’t remember exactly the class pacing, but I do remember doing all the borders at once, and there was only 4 class meeting times and the end was the quilt construction & mitered borders (which are appliqued over). The teacher was really wonderful putting tons of tips & tricks about applique or other items (notions junkie – but that’s GOOD in a teacher, I got to see the stuff in use!). This was supposed to be hand quilted, but when it took 2 years to just have desire to get the center of one wreath done, I decided that I finally needed to quilt this by machine this summer. So I worked with the classic clamshell pattern freehand. A little close up of the border quilting would be good to see too. 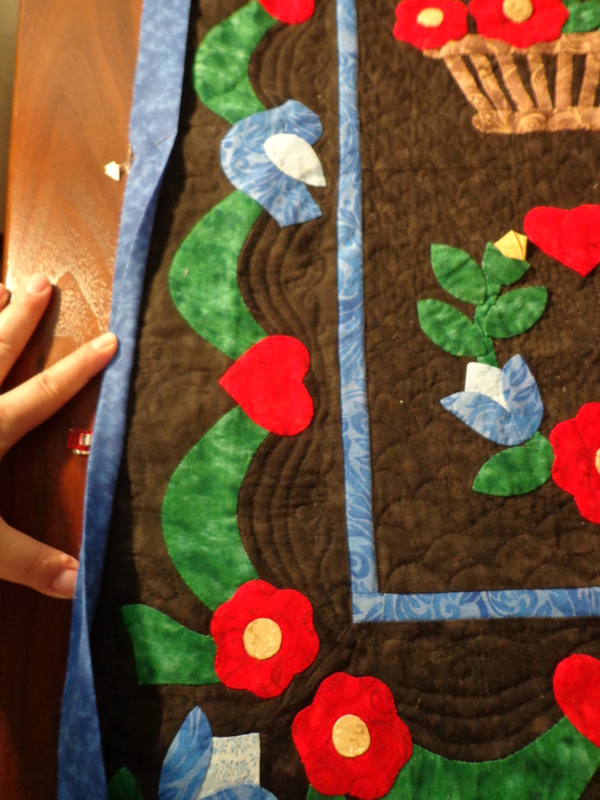 No quilting over any of the applique here. 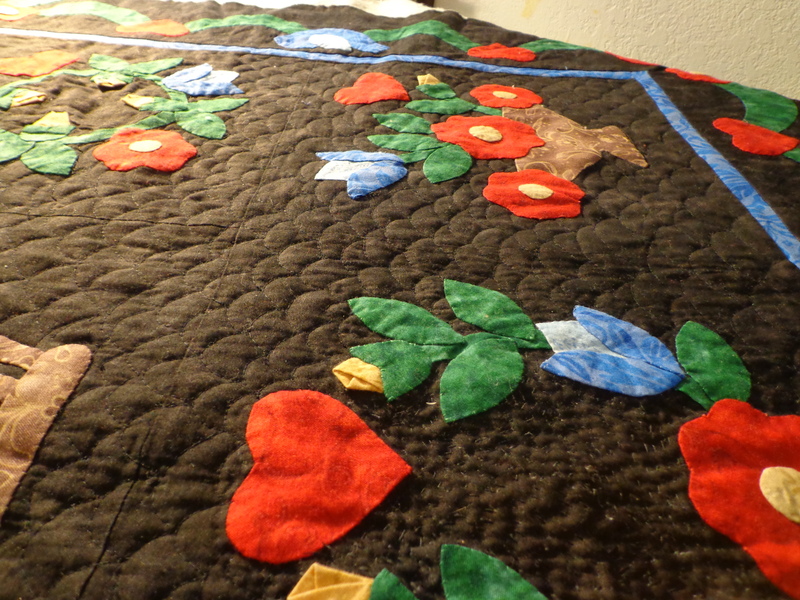 And here’s a good picture of the progress I was making when I was working on this little quilt. And here’s a flickr mosaic of these blocks that I made and put together. You are currently browsing the archives for the Applique category.